Born in Göteborg, Sweden, in 1940, Jan Eliasson was an exchange student in the United States from 1957 to 1958. He graduated from the Swedish Naval Academy in 1962 and earned a master’s degree in Economics and Business Administration in 1965. Eliasson served as Diplomatic Adviser to the Swedish Prime Minister from 1982 to 1983, and as Director General for Political Affairs in the Swedish Ministry for Foreign Affairs from 1983 to 1987. From 1988 to 1992, he was Sweden’s Ambassador to the United Nations in New York where he was part of the UN mediation missions in the war between Iran and Iraq, headed by former Prime Minister Olof Palme. In 1992, he was appointed the first UN Under-Secretary-General for Humanitarian Affairs and was involved in operations in Somalia, Sudan, Mozambique and the Balkans – taking initiatives on landmines, conflict prevention and humanitarian action. In 1993 and 1994, Eliasson served as mediator in the Nagorno-Karabakh conflict for the Organization for Security and Co-operation in Europe. Eliasson was State Secretary for Foreign Affairs from 1994 to 2000 and the Swedish Ambassador to Washington from 2000 to 2005. From 2005 to 2006 he served as President of the UN General Assembly. Eliasson’s distinguished career as a Swedish diplomat culminated in his serving as Minister for Foreign Affairs in 2006. From January 2007 to July 2008, Eliasson was the UN Secretary-General’s Special Envoy for Darfur. 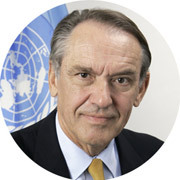 On 2 March 2012, Jan Eliasson was appointed Deputy Secretary-General of the UN by Secretary-General Ban Ki-moon. He took office as Deputy Secretary-General on 1 July 2012. Eliasson is married to Kerstin Eliasson, who was Sweden’s State Secretary for Education and Science from 2004 to 2006. They have three grown children.